About 100 5th graders from Emmett Middle School went to Sagehen Reservoir in May to learn about natural resources in a rare field trip to the mountains. 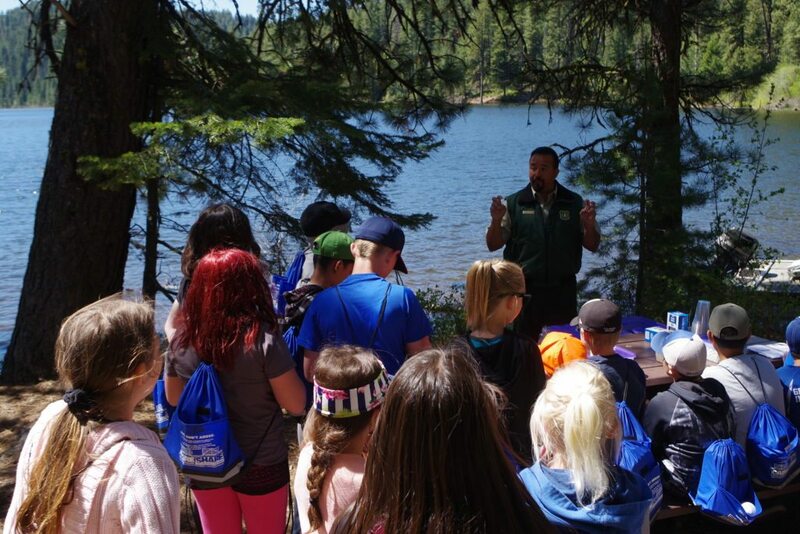 The kids learned about water, wildfire, orienteering, wildlife, fishing and plants during the two-day education event. An overarching lesson shared with the kids is about the Care/Share land stewardship ethic and multiple use land management. That is, if everyone shows respect for other users, we can care for the land and share it for generations to come. Students learn about ground water aquifers from the Forest Service. The Idaho Rangeland Resource Commission provides the educational materials for the event, and Forest Service professionals teach the kids about natural resources. “Yeah, it’s a great opportunity for our 5th grade students to come up here and be part of nature and enjoy the mountains as well as an opportunity to learn in a real-world setting,” said Rich Winegar, principal of Emmett Middle School. At the watershed station, a Forest Service official explains how rivers work in the mountains with a big sandbox. The kids learn about erosion, stream dynamics and stream velocity. The kids could form their own stream, locating trees and rocks along the way. They didn’t hesitate to dig their hands into the sand. Talk about hands-on learning! 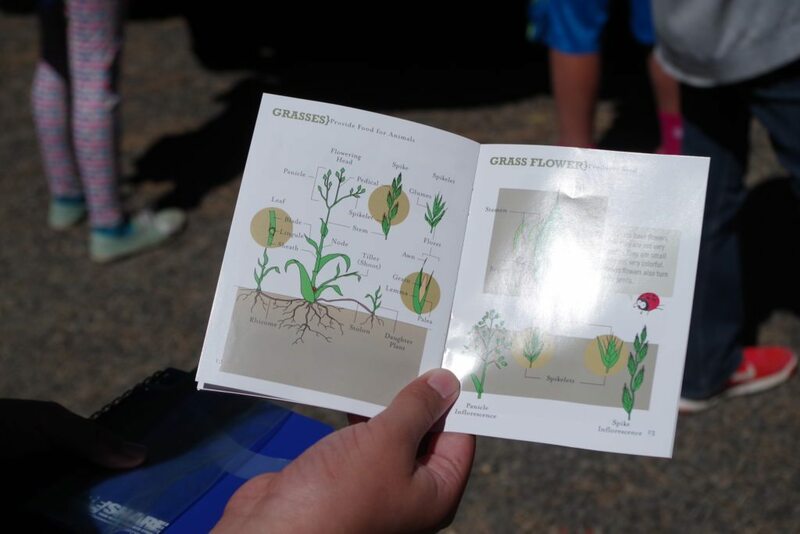 The Idaho Rangeland Resource Commission provides easy-to-understand plant guides for students. At the plant identification station, the kids learn about different kinds of plants that grow in the mountains. The Idaho Rangeland Commission provides field notebooks and a color plant guide. The Rangeland Commission has been working with 5th grade teachers in the Emmett School District and elsewhere to ensure that what the kids learn in the field fits into Idaho educational standards. The “Edible Aquifer” station is a fun one for kids because they get to build a ground water aquifer in a clear plastic cup, using different kinds of candy to show rock, sand and water layers. And then they get to eat the candy afterwards. At the fire station, the kids learn about wildfire. They learn what makes fires burn via the “Fire Triangle.” And the kids learn about rangeland and forest management from matchstick “forests” by managing fuels. Fire experts created forests with different characteristics in rectangular aluminum pans using matchsticks and other materials. “Those are probably dead trees, and those are live trees,” one student says. The live trees have a green mossy cover over the matchsticks. The dead trees do not have any foliage. “That place is going to burn a lot,” another student chimes in. “That one’s not going to burn very much,” another student says. 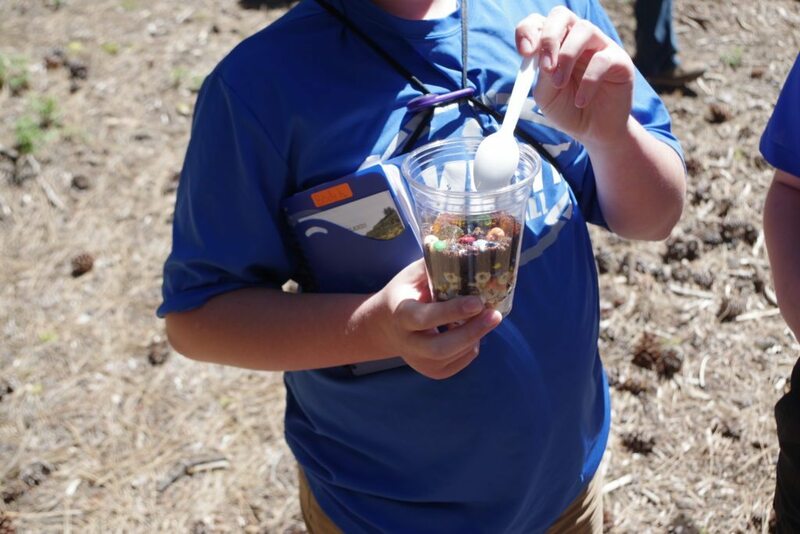 Students learn about ground water aquifers using cereal and candy in a cup to symbolize different rock and sand layers under the earth. Then they get to eat it! Pretty quick, all of the students are talking at once about which forest is going to burn the most, and which one is not. They are engaged. The instructors challenge the kids to explain why. And then the instructors begin to light the forests on fire, one at a time, so they can see how it burns. The forest with the moss on top burns pretty quickly once it gets going. “Wow, that was fast,” one student says. All of the kids are standing close to the picnic table to watch the forests burn. “So this one might not have as many trees as the other forest, but it has the connecting ladder fuel that’s going to connect everything to the top,” the instructor says. Then, the instructor tells the kids to look up at the forest surrounding them. Are the trees spaced closely together? Do the ladder fuels exist? “Oh yeah, I see that,” the students say. “So we call that crown spacing,” the instructor says. At the wildlife station, the kids tried to identify animals from skulls and other wildlife signs in the forest. 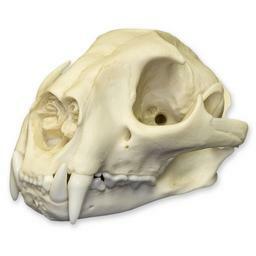 The instructor shows the students a skull and asks them to identify it. “How about black bear,” the instructor says. At another station, the kids learned that cattle grazing in the forest come into Sagehen Reservoir campgrounds to get a drink of water. Having cows in a campground can be upsetting to campers. The kids broke into groups to debate the issue. One boy suggested that if the cows come into your campsite, they should pay for it. “If the cows come in and ruin all of our stuff, they should pay for the camp site or pay us to pick up the stuff,” the boy said. And then a boy representing ranchers steps up to address the critics. “All right man, everyone’s picking on you …” the instructor says. “Well, first of all, we were here first. We provide the beef, we also fertilize the forest, and we don’t let it get too overgrown so you can camp here,” the boy says. And the kids laugh, knowing that’s true. All in all, it was a productive two days of education about natural resources issues for the 5th graders. The kids even learned how to cast a line and catch fish, and they got to roast marshmallows and eat s’mores. The field trips were mutually beneficial because both the Forest Service and the Rangeland Commission want to teach kids more about nature close to home. “Working with the Forest Service, they approached the Emmett School District about getting kids out in the woods. There’s a whole initiative of the Forest Service to get kids out and learn more about where they live,” Hyde says. The Idaho Rangeland Resource Commission provides educational resources to teachers throughout the state. It’s a key part of the commission’s mission. The lesson plans are designed to fit into Idaho education standards for different grade levels for K-12 students. Located only an hour from Emmett, the kids enjoyed learning about nature in a forested environment around Sagehen Reservoir. Ultimately, the objective is for the kids to learn how to be stewards of the land, keying off the Care/Share concept. “Yeah, the overall theme of the whole experience is to become a good steward of Idaho,” says Shelly Gurney. “This is our state, we love this state, it’s so valuable in its resources, and there’s a lot of people who enjoy different activities whether they’re ranchers, or ATVs, campers, fishers, or even just conservationists. Teachers can download classroom and field trip materials from the Rangeland Commission web site (http://idrange.org) or request them from Gretchen Hyde. Steve Stuebner is the writer and producer of Life on the Range, an educational project sponsored by the Idaho Rangeland Resource Commission.